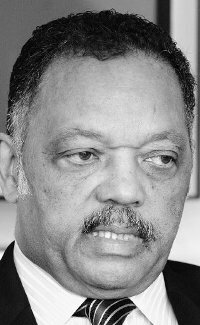 KUALA LUMPUR: Two names have been on the mind of US peace advocate Rev Jesse Jackson Sr since his arrival here on Monday. For civil rights activist Jackson, Prime Minister Datuk Seri Najib Razak and former prime minister Tun Dr Mahathir Mohamad will take Malaysia to its rightful place under the sun. He said Najib had everything going for him to take the nation to a leadership position in the global arena, using the foundation laid by the elder statesman. He saw Najib as priming himself to work on the solid foundation laid by Dr Mahathir to take Malaysia to new frontiers in the domestic and international arenas. "Both leaders have focused on education, especially in terms of high technology. You have a very educated population and one of the fastest- growing economies in the world," he said yesterday. He said both were firm believers in the concept that a stable government was key to development. He said Najib and his team should push this agenda further to underline the fact that Malaysia had political stability and sound economic standing. "I spent a lot of time with Dr Mahathir (this week). He has taken Malaysia from rubber and tin to laptops and the computer age," he said, adding that Malaysia had gone from being "an emerging tiger to a roaring lion". The founder and president of the Rainbow/PUSH (People United to Save Humanity) Coalition drew a rosy picture of the future for Malaysia, which he felt had not attained global recognition for many strong points. "Malaysia is still not on the radar as it should be,' said the 67-year-old pastor who came into prominence after the 1968 shooting of civil rights leader Dr Martin Luther King, besides his two presidential bids in 1984 and 1988. He said Malaysia was "a well-kept secret" which should rightly be accorded the same standing as Japan and Singapore. The former shadow senator for Washington DC left for Thailand later in the day after attending the three-day "Bridges: Dialogues Towards a Culture of Peace" conference here facilitated by the International Peace Foundation with the help of Sime Darby. He had also made the keynote speech at a dialogue at the Institute of Diplomacy and Foreign Relations run by the Foreign Ministry. Jackson invited Foreign Minister Datuk Anifah Aman to Chicago soon for a dialogue on how Malaysia can work with the Rainbow/PUSH coalition to boost world peace. On the case of US-Iranian journalist Roxana Saberi, 31, who was sentenced last week to eight years' jail for allegedly spying for the US, he said he was making arrangements on a personal basis to seek her release. He said he would approach Iranian President Mahmoud Ahmadinejad to seek Saberi's release on humanitarian grounds. "I hope the Iranian leadership is not holding her as a trophy or as a source of diversion from the issues at hand."